If BBQJew.com had a soundtrack, without a doubt it would be the terrific new barbecue-blues compilation album, “Barbecue Any Old Time.” The collection of vintage, early 20th century blues music about barbecue and other such meats was released in September on North Carolina’s own Old Hat Records. Like the authentic, soulful food paid homage to throughout the album, it’s hard to find music this flavorful in today’s quick-cooked world. One would expect an album that is a compilation of blues songs about barbecue and other southern meat treats would be a novelty record, and to a certain degree it is. Yet despite the novelty of the concept, the album is worthy of repeated listening. Many of the songs are as well-crafted as any of the era, and the music varies widely from track to track despite the uniformly carnivorous theme. If your musical palate includes a taste for country blues, urban blues, string bands or even vaudeville there is something on Barbecue Any Old Time for you. 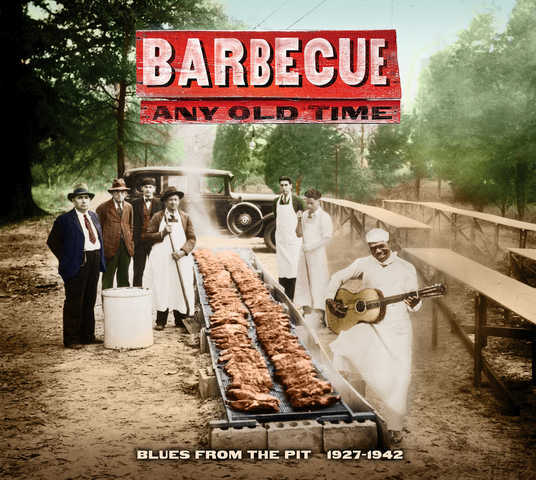 Barbecue Any Old Time serves as a terrific crash course on blues music from the 1920s to early 1940s: it is fueled by energy and mischief, prepared with great vocals and musicianship, and basted in numerous double-entendres. Lyrics like “pepper sauce mama, you make my meat red hot” are among the more over the top refrains, but there are plenty of memorable lines to choose from on an album featuring songs like “Meat Cuttin’ Blues,” “Fat Meat is Good Meat,” and “Pig Meat is What I Crave.” In fact, you may find yourself blushing next time you sit down for a meal. Despite plenty of songs that lean heavily on sexual innuendo, like good barbecue the album is not as simple as it may first seem. Taken as a collection, the songs on Barbecue Any Old Time have a hidden complexity to them that make you want to return again and again. Perhaps that is no surprise given the caliber of musicians featured on the album. The track listing includes blues legends like Memphis Minnie, Blind Boy Fuller and Brownie McGhee, as well as far lesser known artists like Frankie “Half Pint” Jaxon, Bessie Jackson, and The Two Charlies. The liner notes are top notch, featuring a compelling essay by Tom Hanchett, Staff Historian at Charlotte’s Levine Museum of the New South, and succinct but fascinating descriptions of each track. Also included are vintage images of barbecue joints, blues musicians, record posters, and even President Andrew Jackson (read the notes and you’ll learn why). Musical highlights include “Big Boy” Teddy Edwards’ funny but not slight, “Who Did You Give My Barbecue To?”; Frankie Jaxon’s smokey-smooth vocals on “Give Me a Pig’s Foot and a Bottle of Beer”; the rollicking “Pepper Sauce Mama” by Charlie Campbell and His Red Peppers; and Barbecue Bob’s expertly crafted “Barbecue Blues.” Though not every song reaches the pit-cooked perfection of these ones, nearly all are worth tasting more than once. Barbecue Any Old Time indeed. Congratulations to Old Hat Records for tending the fires on this slow-cooked instant classic. *Quote from a letter by Old Hat Records promoting the album. Barbecue and tobacco go together like tobacco and blues, and through the transitive property barbecue and blues go together just as well. In fact, the history of blues music and barbecue are both intertwined with tobacco. While pig pickings were a traditional harvest time tradition in the country, blues musicians crowded urban tobacco auction sites when the crop came in for sale. In North Carolina, tobacco towns like Durham have a rich history of blues music centered around its tobacco industry. North Carolina’s primary contribution to the blues, a style called the Piedmont Blues, was made famous by artists like Blind Boy Fuller, Sonny Terry and Brownie McGee and the Reverend Gary Davis, as well as somewhat lesser know artists like John Dee Holeman, who still lives in Durham just blocks from the old tobacco district. Perhaps it is no surprise that the blues industry created an artist who could capture the barbecue demographic. 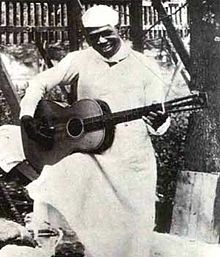 Robert Hicks (1902-1931), better know by his recording name Barbecue Bob, was a Georgia native who worked at a barbecue restaurant in Atlanta at the time he was signed to Columbia Records. The label decided that they could cash in on Hicks’ barbecue connection, and gave him his nickname. Barbecue Bob played in the Piedmont Blues style, bringing a country blues flair to his work. Barbecue Bob’s first single was, predictably, called “Barbecue Blues,” and sold a pace setting 15,000 copies. The publicity photo (inset) of Barbecue Bob wearing a chef’s uniform proably didn’t hurt sales. How the song relates to barbecue, however, is anyone’s guess; it is certainly not an obvious lyrical connection. Although there is no mention of slow cooking hogs, I still hope you enjoy the recording of the “Barbecue Blues” below. The song shows off Barbecue Bob’s terrific beyond-his-years voice, guitar picking skills and even BBQJew.com-appropriate lyrics (“I’m going to tell you now gal/like Gypsy told the Jew/If you don’t want me/it’s a cinch I don’t want you.”) Now THAT’s the Jews blues. Joe Kwon is the high octane cellist (eat your heart out, Yo-Yo Ma) for the Avett Brothers, a North Carolina-based band that has steadily grown its reputation and commercial success over the past few years. It is perhaps no coincidence that the Avetts reached new levels of success following Kwon joining the band in 2007 for a tour and album called Emotionalism. When he is not on stage, you’ll find Kwon settling in at restaurant tables across the United States, a foodie hobby he chronicles on his well-written and even better photographed blog, Taste on Tour. A resident of Durham, Kwon agreed to an interview with me after I saw an article in the Independent Weekly about him eating barbecue at nearby restaurant, The Pig. Read on to see Kwon discuss why kimchi would pair well with a BBQ sandwich, life on the road with the Avett Brothers, and the importance of supporting local agriculture. If you’d prefer to download a .pdf of this interview, click here. BBQJew: Tell me about your upbringing. Where did you grow up and what brought you to North Carolina? Joe Kwon: I was born in Inchon, South Korea and moved to Archdale, NC back in 1981. Archdale, NC is practically in the middle of nowhere but it was near my extended family, in particular my aunt. It was her convincing that brought my family to the states. Growing up, we had weekly family dinners with over 20 extended family members eating traditional Korean food and just playing around with other family members. I had several cousins near my age and this was a time for all of us to get together and be close. Those family dinners were definitely the starting point of my love for food. JK: As I mentioned above about the role of food, it was always around for family dinners. We ate so much food at these dinners because they were almost always potluck style and each family would bring at least two dishes. It was almost as if you knew who had the best of each dish as well. I remember one of my aunts always making the egg rolls and the tonkatsu (fried pork cutlets) and my mom making all sorts of kimchis and sweet and sour pork (Korean style). There was always a plethora of food to be eaten and sampled. My parents were both musicians. My sisters both played piano, and I was going to play music no matter what. I really didn’t have a choice in the matter. When I was 3 my mom tried to teach me piano. I probably was too ADD to sit still at that age because she didn’t press it hard enough for me to continue playing. When I turned 9 though I showed up at my first cello lesson and it’s all history from there. Follow this link to read the interview with Anoop Desai. If you want to read Desai’s honors thesis on barbecue, click here. When most people think of the music that best goes with barbecue, they undoubtedly name blues or bluegrass. 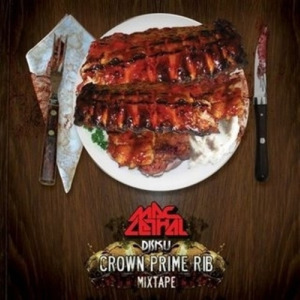 But rap music may be a contender on the barbecue scene. Witness hip hop icon Snoop Dogg, who according to an incredibly uninformative article in the UK’s Mirror, is reported to be “sniffing out a recipe to make his own barbecue sauce after finding the quality in Europe was dogg rough.” It is unclear what this sentence means or why anyone in his right mind would use the phrase “dogg rough,” but it’s an intriguing tidbit nonetheless. Last I heard of Snoop Dogg’s culinary adventures (okay, I watched “Snoop Dogg’s Father Hood” on TV once or twice, I admit it) he was scarfing down chicken and waffles from the legendary Roscoe’s. It’s good to hear that the rap legend has a taste for ‘cue too. 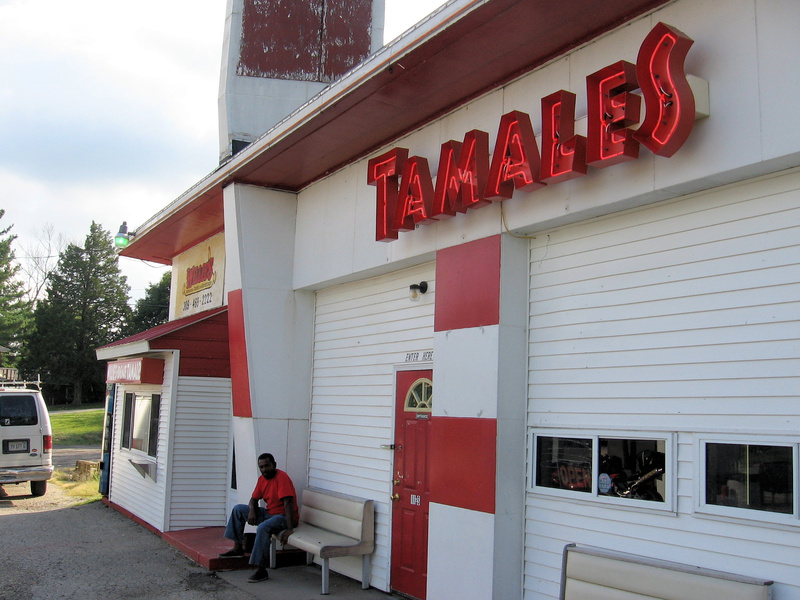 Perhaps it’s no surprise that a Kansas City rapper would dedicate some rhymes to his city’s favorite food. (Rapping about barbecue puts a whole new spin on the phrase “biting rhymes.”) According to The Pitch music blog, hometown rapper Tech N9ne’s latest album i s called “The Gates Mixed Plate,” a reference to legendary Gates Bar-B-Q. Here’s to hoping Tech N9ne’s album is fresh like Ollie Gates’ ‘cue and not stale like his hip hop moniker. I don’t know if any North Carolina hip hop stars like barbecue, but given that 9th Wonder, arguably North Carolina’s most famous rapper, hails from Winston-Salem it seems likely.